Start and expiry dates of a skill or set perpetual for skills that do not require an expiry date. Skill status is colour coded with a key that explains what each colour indicates. 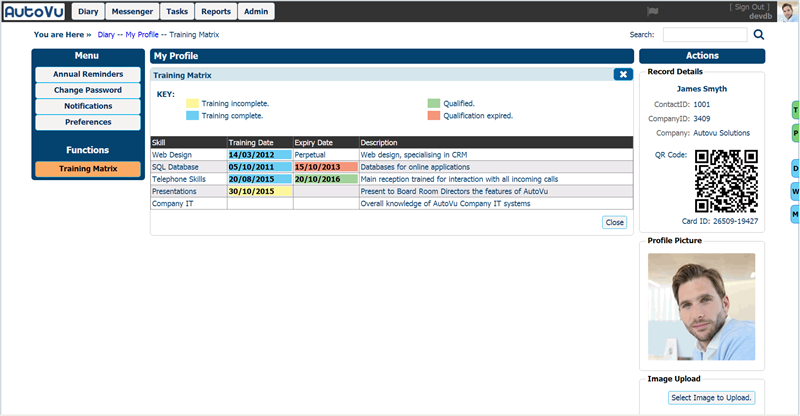 Dates can be included where required, the absence of a date indicates that the training date has not yet been set. 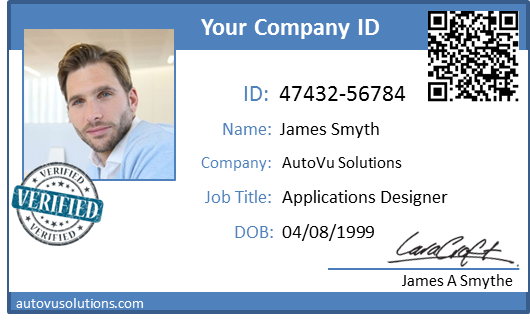 Today, identification is a serious matter, that’s why we have designed AutoCred the online ID verification service. Trusted, secure and highly reliable. 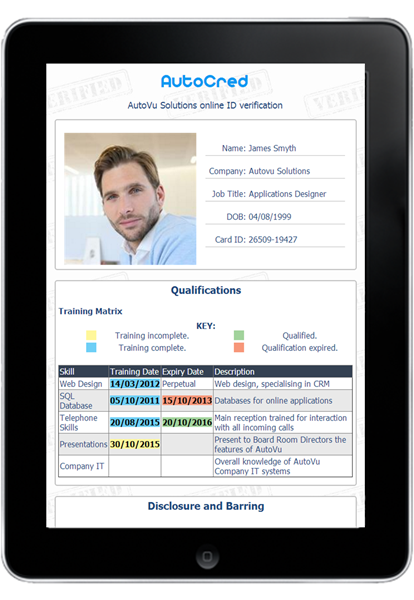 Instant online identification for your workforce through their personal identity card. By Issuing your workforce with ID cards showing our unique encrypted QR code that is automatically generated from My Field CRM, your customers can instantly verify the validity of the card, your representatives, and their training status for a given task. The trust that this can give your customers knowing that you have a process like this in place is second to none. Go ahead and try the sample shown here on the right. Use your mobile device to read the code and view the details of James’ (you can click the QR code too). This will take you to our secure ID verification server giving you a typical example of a basic ID verification. An encrypted code embedded within the QR matrix ensures that user details are kept safe. Without the QR code ID, it is practically impossible to obtain a users details by simply guessing the URL. You can print the card yourself, or we can do it for you. We charge a flat rate of £20 per card with a typical layout similar to that shown above. There is also the option of having 'AutoCred Verified' cards, these are similar cards except that they have a two year expiry and the online verification shows that strict verification methods have been applied to confirm the identity of the card holder. These include CRB checks and personal ID verification documents submitted to us that meet the required standard for identification. This of course is purely optional and is often driven by the needs of your customers. A highly useful section of AutoCred is the ability to show a qualifications matrix. This can be as simple or complex as you wish, with custom defined fields that allow you to fine tune every aspect. This can give instant peace of mind to your customers that the engineer is qualified to undertake the task at hand. The data is real time so as soon as you update it on My Field CRM, the ID card on AutoCred will reflect the changes immediately. Formerly CRB checks. These details where available can be included on the ID verification card shown on AutoCred in the form of certificate number, issue date and status. Uploaded by the employer on having received the necessary details. AutoCred monitors all details submitted to the secure server and reserves the right to withdraw access immediately upon suspicion of fraud. By the customer insisting on an 'AutoCred Verified' status will eliminate the possibility and ensure continued peace of mind. 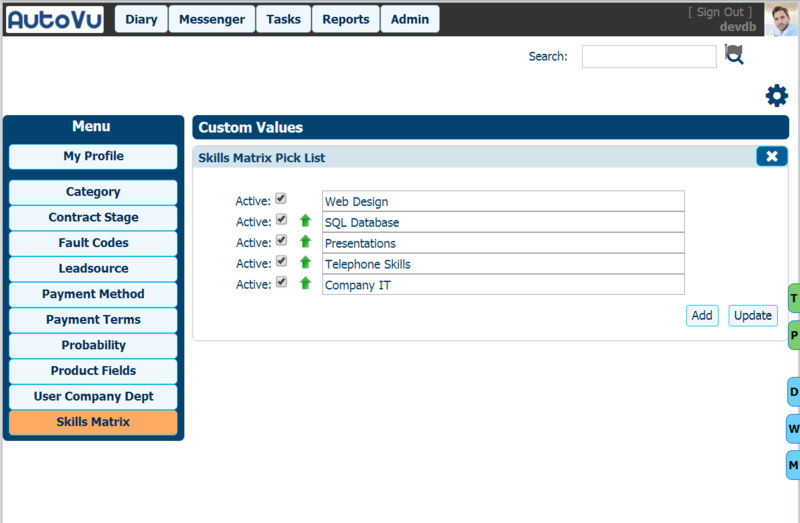 Pick lists are a useful method of quickly adding items on to your training matrix. You can define as many skill items as required and sort them in to skill priorities. Easily delete any incorrectly added entries, and edit current ones to reflect any new stages attained. 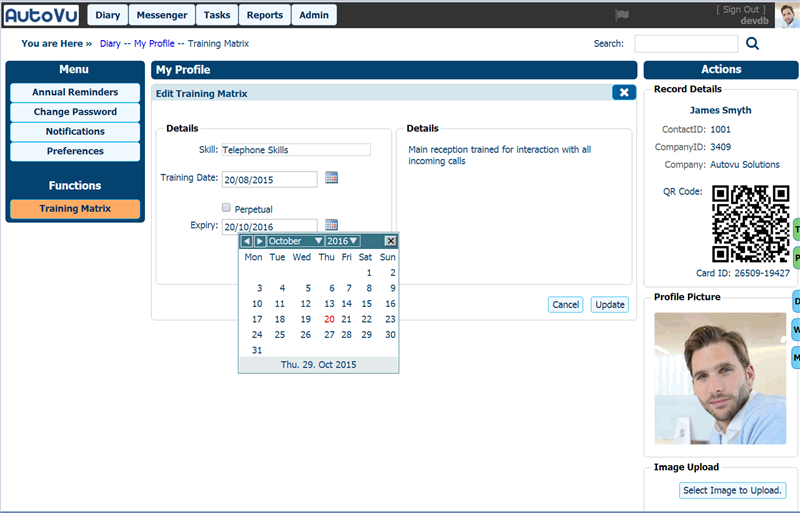 View training records for staff, Keep up to date with records and view online at any time. Include start and expiry dates or when training is due to begin.